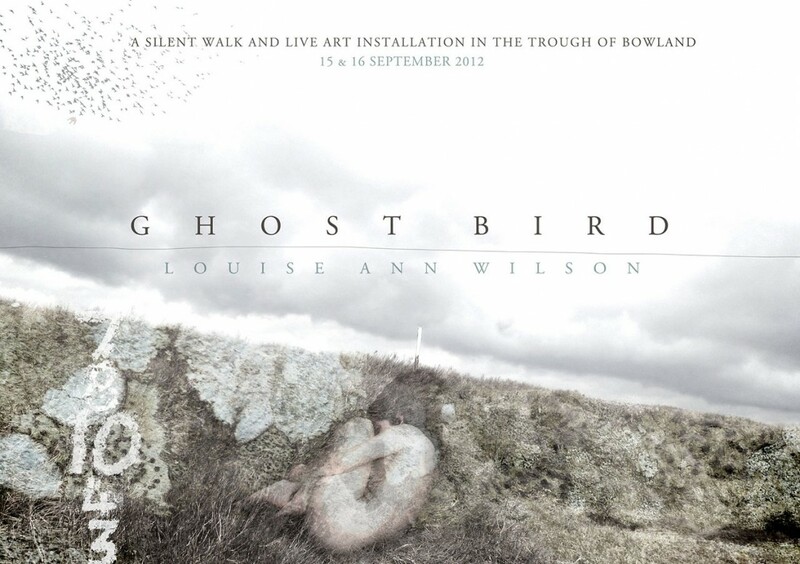 Louise Ann Wilson's Ghost Bird is a beautifully-crafted silent walk and live art installation specific to an upland valley in the Trough of Bowland, a landscape that is internationally important for its heather moorland, blanket bog and rare birds. Following a pathway into upper reaches of the valley, you will be invited to walk in silence onto the moorland where you will discover installations and interventions made from the materials of the place that are inspired by the landscape and in particular the Hen Harrier. Here you can take your time to look, listen and reflect on the environment around you. Referring to the ghostly grey feathers of the male Harrier and the absence this year of nesting pairs in the Trough of Bowland, Ghost Bird celebrates the beauty of the Hen Harrier and draws attention to their sometimes fragile existence within the North of England. In doing so, the work also becomes a means of reflecting on the journey taken 400 years ago over the Bowland Fells to Lancaster Castle by the Pendle Witches. Ghost Bird is the latest project by the internationally-celebrated artist Louise Ann Wilson, known most recently for the walking performances Jack Scout (2010) and Fissure (2011). In this new small scale piece, installations and acts of live performance combine to create a unique walking experience set within a stunning upland landscape. Ghost Bird is created and directed by Louise Ann Wilson with choreography by Nigel Stewart of Sap Dance; is performed by dance artist Julia Griffin and a team of life-models. Ghost Bird is commissioned by Green Close for The Lancashire Witches 400 Programme, co-commissioned by Live at LICA and produced by the Louise Ann Wilson Company Ltd. It has been made with the support of land-owners United Utilities Estates and their tenants, the Forest of Bowland Area of Outstanding Natural Beauty and Hen Harrier experts from the RSPB. This project is part of Lancashire Witches 400, a diverse creative programme initiated by Green Close in Melling which explores the heritage of the Lancashire Witches, the 400th anniversary of their trial and execution, and the enduring issue of persecution today. This event is free, but in order to attend visitors must register by email via ghostbird@louiseannwilson.com, including the size of your party, their individual names and email addresses. Numbers are limited and further information about the piece, including its location, will be sent out in advance. Children to be accompanied by an adult.